Phonographic Copyright (p) – Serious Records Ltd.
Phonographic Copyright (p) – Neo Records Ltd.
Phonographic Copyright (p) – Perfecto Records Ltd.
Phonographic Copyright (p) – Deconstruction Ltd.
Phonographic Copyright (p) – Kickin Music Ltd.
Phonographic Copyright (p) – Harvey Recordings Ltd.
Phonographic Copyright (p) – Passion Music Ltd.
Phonographic Copyright (p) – Bedrock Music Ltd.
Phonographic Copyright (p) – Hope Recordings Ltd. Licensed To – The Echo Label Ltd. Licensed To – Media Records Ltd. Licensed From – BMG Entertainment International UK & Ireland Ltd. Licensed From – Edel UK Entertainment Ltd. Licensed From – Neo Records Ltd. Licensed From – Warner Special Products, Inc. Licensed From – Mighty Bop Sessions Inc. Licensed From – [PIAS] Recordings UK LTD. Licensed From – Virgin Records Ltd.
Record Company – SFP Records, Inc. Published By – Doors Music Co. Published By – Edizioni S.I.A.E. Published By – Sounds For People Publishing, Inc. Published By – Edel Publishing Ltd. This is the standard edition. There's also a box set edition. Track 1-1 published by EMI April Music, Inc. / Future Furniture Music (ASCAP). ℗ 2000 Serious Records Ltd. Licensed from Universal Music Licensing Division. Track 1-2 published by Edition Gigolo / Wonder World Music Publishing / Universal Music. ℗ 2000 Data Records / Ministry Of Sound Recordings Ltd., under exclusive license from EDM Music Productions GmbH. Licensed courtesy of Ministry Of Sound. Track 1-3 published by Nettwerk Music UK / Chrysalis Music Ltd. / Tyde Music / Sony/ATV Tunes. ℗ 2000 Nettwerk Productions. Licensed courtesy of Nettwerk. Original version on the Delerium album "Karma". Track 1-4 published by BMG Music Publishing Finland. Licensed from 16inch Records, Finland. ℗ 1999 Neo Records Ltd. Licensed courtesy of Ministry Of Sound. Track 1-5 published by Upright Songs / PLG MV / BMG-Ufa. Co-produced for Gang-Go Music Production GmbH, Cologne. Remix and additional production for Aqualoop Productions. ℗ 1999 The copyright in this sound recording is owned by Orbit Records GmbH, under exclusive license to EMI Records Ltd. Licensed courtesy of EMI Commercial Markets. Track 1-6 published by Ministry Of Sound Publishing. 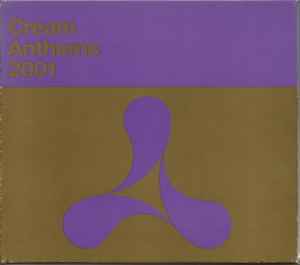 ℗ 2000 ATCR, exclusively licensed to Virgin Records Ltd.
Track 1-7 published by Mute Song. ℗ 2000 The copyright in this sound recording is owned by Perfecto Records Ltd. Licensed courtesy of Perfecto / Mushroom Records. Track 1-8 published by EMI Music / Sherlock Holmes Music / Warner Chappell. ℗ 2000 Deconstruction Ltd. Issued under license from BMG Entertainment International UK & Ireland Ltd.
Track 1-9 published by Little Idiot Music / Warner Tamerlane. ℗ 1998 Mute Records Ltd. Licensed courtesy of Mute Records. Track 1-10 published by Paul Van Dyk, administered by BMG UFA Musikverlage / Brown / Mann / BMG Music Publishing Sweden / Connotation Music. ℗ 2000 Paul Van Dyk. Licensed from Deviant. Track 1-11 published by BMG / Warner Chappell. ℗ 2000 Multiply Records. Licensed courtesy of Multiply Records. Track 1-12 published by MCA-PolyGram Songs / Cyclus Musik Verlage. ℗ 1999 edel Records GmbH. Licensed from edel UK Entertainment Ltd.
Track 1-13 published by Strengholt Music Publishing. ℗ 2000 Kickin Music Ltd., licensed to Virgin Records Ltd.
Track 1-14 published by Activate Music Publishing. Produced, arranged and mixed for Activate Music Productions in association with House Nation Records. ℗ 2000 Dance Street GmbH, under exclusive license for the UK and Eire to The Echo Label Ltd. Licensed courtesy of Echo. Track 1-15 published Media Songs SRL / Warner Bros. Music Italy, SRL / Media Songs Ltd. ℗ 2000 Media Records Ltd., exclusively licensed to Virgin Records Ltd.
Track 1-16 published by BMG Music Publishing Finland. Produced and mixed at JS16 Studios. ℗ 2000 Neo Records Ltd. Licensed from Neo Records Ltd.
Track 1-17 published by Warner Chappell. ℗ 2000 Harvey Recordings t/a Cream Records, licensed to Virgin Records Ltd.
Track 1-18 published by Alphabet City GmbH / Warner Chappell Music Ltd. / Hanseatic Musicverlag GmbH. ℗ 2000 The copyright in this sound recording is owned by Alphabet City Records GmbH, under exclusive license to EMI Records Ltd. Sample taken from "Everybody's Got To Learn Sometime" performed by The Korgis. Available on Positiva Records. License courtesy of EMI Commercial Markets. Track 1-19 published by Copyright Control. Produced for Nylon Productions 2000. ℗ 2000 The copyright in this sound recording is owned by EMI Records Ltd. Available on Positiva Records. Licensed courtesy of EMI Commercial Markets. Track 1-20 published by Step By Step Songs. ℗ 2000 Passion Music Ltd., exclusively licensed to Virgin Records Ltd.
Track 1-21 published by Media Songs SRL / Warner Bros. Music SRL. ℗ 2000 Media Records Ltd. Original sound recordings produced and released by BXR Records and owned by Media Records Srl. Licensed courtesy of Nukleuz Records. Track 2-1 published by Universal Music Publishing Ltd. / Doors Music Co. / Jim Morrison Music / Rondor Music. ℗ 2000 Skint Records. Contains elements of "Bird Of Prey", performed by Jim Morrison, licensed courtesy of Warner Special Products Inc. Appears courtesy of Skint Records. Track 2-2 published by Blonde Music / Falke / Queme. ℗ 2000 Vulture. Contains a sample from "Crush On You", performed by The Jets, published by Irving Music Inc. (BMI) / Almo Music Corp. (ASCAP). Used courtesy of MCA Records, under license from Universal Music Enterprises, a division of UMG Recordings, Inc.
Track 2-3 published by Sony Music Publishing / Kings Of Tomorrow (BMI) / Yum Yum (ASCAP). Original music produced for Kings Of Tomorrow Productions. Vocals and music intermix engineered for Lazy Dog. ℗ 2000 Everything But The Girl, exclusively licensed to Virgin Records Ltd.
Track 2-4 published by S.I.A.E. / Copyright Control / Lucky Three Music Publishing / Rondor Music / Universal Music. Co-produced for F&G Management UK. ℗ 2000 The copyright in this sound recording is owned by Cristiano Spiller, under exclusive license to EMI Records Ltd. Available on Positiva Records. Contains a sample from Carol Williams' "[url=https://www.discogs.com/Carol-Williams-Love-Is-You-Just-Feel/master/665026]Love Is You[url]". Licensed courtesy of EMI Special Markets. Track 2-5 published by Sony Music / Warner Chappell Music / Universal Music Publishing. ℗ 2000 Y. Destagnol / R. Tranchart. Contains a sample of "Soup For One", published by Sony/ATV Songs (BMI) / Warner Tamerlane Publishing Corp. o/b/o/ Bernard's Other Music (BMI), performed by Chic, used courtesy of Mirage Records. Licensed courtesy of Universal Music Licensing Division. Track 2-6 published by Universal Music Publishing Ltd. / Warner Chappell Music Ltd. ℗ 2000 Vicious Vinyl Pty. Ltd., exclusively licensed to Virgin Records Ltd.
Track 2-7 published by Chrysalis Music Publishing. ℗ 1999 The Echo Label Ltd. Licensed courtesy of Echo. Track 2-8 published by Chrysalis / Decon Songs. ℗ 2000 Skint Records. Appears courtesy of Skint Records. Track 2-9 published by Copyright Control. Produced and mixed for Juicy Music. ℗ 2000 Milk & Sugar Recordings. Licensed courtesy of Multiply Records. Track 2-10 published by Al Jarreau Music / Desperate Music / Garden Rake Music (BMI) / Universal Music. ℗ 2000 Azuli Records. Features a sample from the Al Jarreau recording "It's Easy", under license from Warner Bros. Records Inc. by arrangement with Warner Special Products. Licensed courtesy of Azuli Records. Track 2-11 published by Sound For People Publishing Inc. (BMI)/ Sub-published by Universal Music Publishing Ltd. (UK) / Derry Music. Produced for Juicy Music and for Asphalt Records. ℗ 2000 Asphalt Records, a division of S.F.P. Records, Inc. (USA). Licensed courtesy of Sony Music Entertainment (UK) Ltd.
Track 2-12 published by MCA Music Ltd. / Chrysalis Music Ltd. Produced for Mighty Bop Sessions. ℗ 2000 Defected Records Ltd., under exclusive license from Mighty Bop Sessions Inc. Includes a sample of "Look For Love" by Cerrone, additional publisher: Cerrone Music (SACEM), courtesy of Maligator Records / C. Side Music. Licensed courtesy of Defected. Track 2-13 published by edel Publishing Ltd., administered by Sony Publishing. ℗ 2000 edel UK Records Ltd. Licensed from edel UK Entertainment Ltd.
Track 2-14 published by Edition Tse / Alphabet City / Warner Chappell. Remix and additional production courtesy of Junior. ℗ 2000 Bedrock Music Ltd. Licensed courtesy of Bedrock. Track 2-15 published by Basic Groove Publishing. Produced at The Wake Up Lab around Paris. ℗ 2000 F Communications. Version available on the album "Unreasonable Behaviour". Licensed courtesy of PIAS Recordings UK. Track 2-16 published by EMI Music / Copyright Control. ℗ 2000 The copyright in this sound recording is owned by Hope Recordings Ltd., under exclusive license to Perfecto / Mushroom Records. Licensed courtesy of Perfecto / Mushroom Records. Track 2-17 published by Off Course Music. ℗ 2000 The copyright in this sound recording is owned by NEWS, under exclusive license to EMI Records Ltd. Contains a sample from "[url=https://www.discogs.com/Grauzone-Eisbär-2007/master/42687]Eisbar[/url], recorded by Grauzone, used by permission and under license from Off Course Records, Switzerland. Licensed courtesy of EMI Commercial Markets. Track 2-18 published by Universal Music Publishing Ltd. ℗ 2000 The copyright in this sound recording is owned by EMI Records Ltd. Taken from the album "Little Kix". Licensed courtesy of EMI Commercial Markets. Track 2-19 published by Soma Music (originally publisher 1993). ℗ 2000 Soma Recordings Ltd., licensed by Virgin Records Ltd.
Track 2-20 published by Media Songs SRL / Warner Bros Music SRL. ℗ 2000 Media Records Srl, exclusively licensed by Media Records Ltd for the UK and Eire. Original sound recordings produced and released by BXR Records and owned by Media Records Srl. Licensed courtesy of Nukleuz.com. Concept and compilation for Box Music Ltd. in association with Virgin Commercial Marketing. © 2000 Virgin Records Ltd. The copyright in this sound recording is owned by Circa Records Ltd. ℗&© 2000 Circa Records Ltd. This compilation ℗&© 2000 Circa Records Ltd. The copyright in this artwork is owned by Virgin Records Ltd. © 2000. Made in the EU. Printed in the EU. Comes in a regular sized double jewel case, with a outer cardboard slip-case & 22 page booklet. Track 1-3 lists credits for the Airscape remix alongside the DJ Tiësto credits, that information has been omitted for the notes above and the submission in general. Track 2-6 is labelled as the "Ain't No Love Remix" on the back inlay and the book and the credits appear for this version when it is in fact the original version that appears on the release, they too have been omitted for the above notes and submission.